Just a few weeks ago our Youth & Children’s department decided to support this beautiful little girl, Aradhya, with weekly offering the children bring to JClub through the work of World Vision. Her full name is Aradhya Kumari and her birthday is on the 23rd May. She lives with her parents. Her father and mother are both self-employed. She goes to pre-school where her favourite subject is colouring. Most children in the community will be expected to help out at home with household chores, but Aradhya is currently too young to undertake any tasks. She loves playing ball games. The sponsorship from our children in JClub (£30.00 per month) will transform life for Aradhya, and for her family, friends and community. Amongst other things, showing parents how to cook nutritious meals will help children recover from malnutrition, and help them grow up health and strong; teacher training and new school equipment will help children to reach their full potential; and new farming techniques and livestock will help parents earn more money to give their children what they need to do well in life. As well as this, Aradhya’s life will change in ways we cannot measure. Your love and support show her that she is someone who is valued – simply for being herself – by people she has never met. People who live many miles away. Your letters or postcards tell her she is in your thoughts and that feeling will help her grow in self-confidence. We’ll come to see the difference through her letters and videos. Explore the place where Aradhya lives, a place so different from our own: where hardship is being replaced by opportunity and fear is being replaced by hope. Geographically diverse India is the second most populated country in the world. Despite India’s booming economy, almost half the population lives on less that £1 a day. Many children are malnourished and suffer diseases such as malaria and polio. Diarrhoea is the leading cause of death in children. For children like Aradhya, growing up in Vaishali, hunger and malnutrition are everyday realities. Jobs are hard to come by so parents find it hard to earn enough to provide their children with life’s essentials. Those children who are able to attend school struggle as teachers are poorly trained. World Vision has been working with the community of Vaishali since 2005. Back then, children faced many problems; malnutrition; fear of illness; poor hygiene; and lack of education. Since then, things have begun to change for the better. Children are recovering from malnutrition, giving them the strength to run, play and enjoy their childhoods; more babies are being breastfed and immunised, keeping them healthy, disease-free and giving them the best possible start in life; and more children are going to school and getting the education they need to reach their potential. Yet there is still so much to do. It has always been World Vision’s experience that if you want to change things for the better – and make those changes last – you have to stick around. 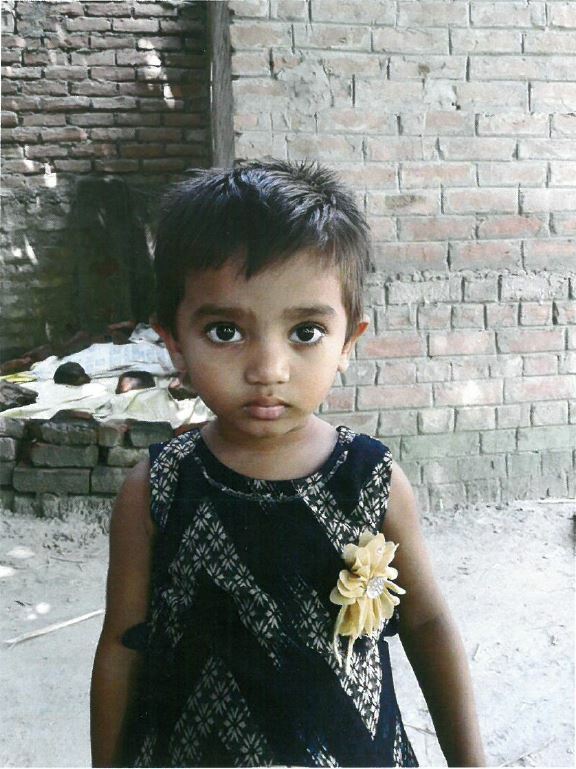 Thanks to the decision to sponsor Aradhya, World Vision can stay in the area until 2022. They will sonly go once they are confident the changes you have helped make, and the hope you have given, will continue after they have left. Thank you for joining this journey in creating a world where Aradhya is free to enjoy her childhood, to be loved, protected and cared for, and to enjoy good health and an education. How can I find out more about Aradhy’a life? Throughout the year, we will received news of how Aradhya is doing. Her community will be changing all the time as World Vision’s work continues, improvements are made and the community’s needs change. We will receive regular updates by post, and also by email with links to photos and videos. Each year World Vision will send Christmas and Birthday cards that the children can personalise and send on to Aradhya, along with their own greetings and good wishes. Does the money go just to Aradhya and her family? World Vision has learned from experience that the best way to raise children out of poverty and give them hope for the future is to work with their whole community. If you give a child money but they don’t have a school to go to, they can’t educate themselves. So World Vision invests in schools, clinics and other services to benefit all children. including Aradhya.